Almost 98 percent of Kazakhstan's voters backed the incumbent leader Nursultan Nazarbayev in a snap presidential election, preliminary results of the Kazakh Central Election Commission say. Earlier, exit polls had confirmed Nazarbayev’s overwhelming victory, while there was a voter turnout of over 95 percent. International and local observers at polling stations across the country have reported no significant violations. There were a total of 858 observers from 19 countries present. Nazarbayev, who has been in power since 1991, was contested by two other candidates, the leader of the Communist party and the leader of the state labor unions federation. However, they are widely seen as non-competitive, with Nazarbayev clinching 95 percent of the votes in the previous election in 2011. The country's marginalized opposition hasn't put forward a candidate. "I am sure Kazakhs will vote primarily for stability," Nazarbayev said after casting the vote at one of the polling stations in Kazakhstan's capital, Astana. He has been the country's president since the post was established at the break-up of the Soviet Union. 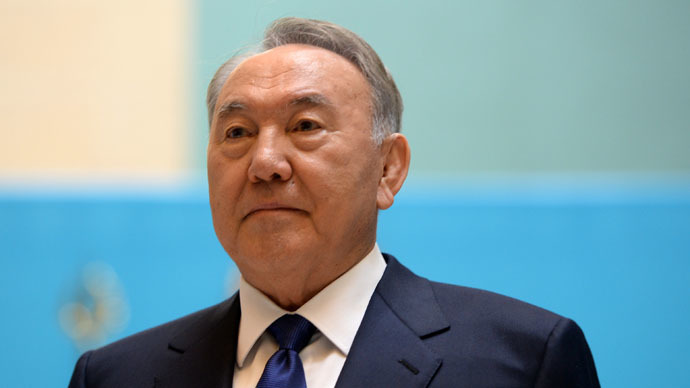 Nursultan Nazarbayev, 75, is often accused of suppressing opposition and freedom of speech. In 2014, the French Geopolitical Crime Observatory gave him the title 'Dictator of the Year', beating Zimbabwean President Robert Mugabe as well as three toppled leaders: Tunisian Zine El Abidine Ben Ali, Egypt's Hosni Mubarak and Haitian Jean-Claude Duvalier. Opposition journalists accuse him of cultivating a personality cult, to which he owes his high election results. Nazarbayev is promising to take his country into the world's top 30 best-developed countries. "Should Kazakhs show me their trust again, my first act will naturally be to create a committee on implementing five constitutional reforms," he said. Those reforms are aimed at "not letting the global crisis negatively affect [Kazakhstan's] development, to maintain the speed of growth and prepare grounds for a new leap ahead." The Organization for Security and Cooperation in Europe (OSCE) has complained about Nazarbayev's "institutional advantage," saying his posters were visible throughout the country, while the other candidates presented little to no campaigning. However, the electoral committee says all camps were given equal opportunities to rally support. The election comes a year earlier than scheduled. The decision to hold a snap vote was taken after calls from the advisory body Kazakhstan People's Assembly. It said the president needed "a new mandate of people's trust to ensure the country can withstand the period of global hardship," referring to an overall difficult global economic situation.